AS LEADERS: What's it worth in your organization to have a culture where reactions to change are understood, well managed and positively discussed ... where people demonstrate high interpersonal, leadership and team building skills ... and where everyone stays emotionally intelligent, or emotionally smart, when negotiating and addressing conflict? If these competencies matter to you, consider having Dr. June present at your next professional development or conference event. AS EMPLOYEES: Do you want better results for your time and effort? Are you held back from receiving recognition, increased visibility, endorsement, promotions or raises? Or worse, in performance evaluations do you receive feedback that your approach is holding you back? If so, these powerful and practical People SMART Workshops could help you break through the "same old - same old" ways of being, doing, reacting and receiving. Take action now to have Dr. June present the following hands-on, helpful and fun sessions to you and your colleagues. You've heard it said - our intellectual intelligence gets us hired but our emotional intelligence gets us promoted. Savvy and astute people "get" being emotionally SMART - staying grounded, centered, and focused (particularly when life does a "run-away") so they achieve the best results possible for their time, money, energy, resources and talent! 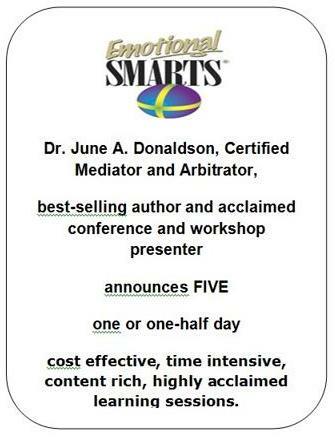 Learn about Dr. Donaldson's Emotional SMARTS® concept - a proven, powerful and easy to apply process to improve yourself, your life, your work and relationships! Relationship Building-or "Why can't THEY be more like ME?" This workshop can help you figure out what makes you tick one way and others tick another. It focuses on attitudes, thoughts, behaviours and other interpersonal mysteries. Participative activities will give you the inside scoop on how to pro-actively present yourself and your ideas so you easily and quickly gain support and endorsement from others. No more undermining, no more personal attacks, no more passive-aggressive behavior or holding grudges. Dr. June is leading the charge to teach the world about conflict so we can all live with less second guessing and lower stress while achieving higher quality relationships, greater work outcomes and a happier heart! Whatever role you have in an organization, knowing the over 20 steps to earning the right; fact finding; presenting your case; and closing the interaction so that the majority of time everyone "wins" something puts you at a distinct advantage. It's said that "life is one long sales call" and you'll find this workshop full of "ah-ha's" as you apply its content to advancing the ideas or products you have and the work you do. Navigating through the complexities of changing work relationships, family dynamics and the dance of relationships can be overwhelming - even on good days! Learn how emotional, behavioural, generational and gender dynamics can hook you and your performance. Then you can decide how to get "unhooked" by these powerful influences and reframe situations so you can move on, move up or move out.